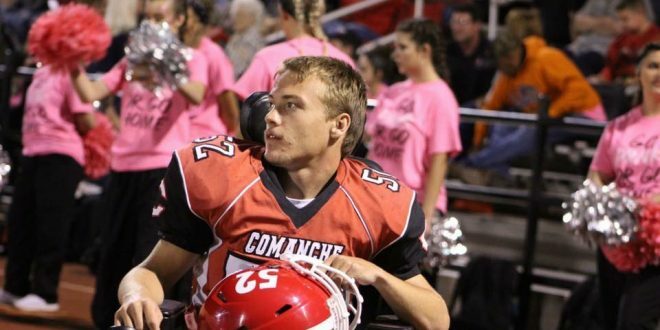 An Oklahoma high school football team rallied around a player on the opponent team, who was in a wheelchair, and let him score a touchdown. A video taken at last night’s Comanche Indians high school football game is catching quite a bit of attention online because it was one very special moment for a senior who got to take the field for the first time. Jordyn Campbell is a senior at Comanche High School who has cerebral palsy and although he is in a wheelchair, his mother, Jennifer Hinsley, says that doesn’t stop him. Campbell is an avid football fan. He has been a part of the Indian’s football team since the start of high school. But no night under those lights will ever come close to this one. He made his career debut during Thursday night’s Senior Night. Not only did he play, he scored a touchdown. Jacob Davis, a senior and one of Campbell’s best friend, was the orchestrator of it all. He discovered that all Jordyn wanted out of his senior year was one thing, to get a chance to play in a game. So, with a little help, Davis got him onto the field. Melissa Hyde captured the video. She says Campbell always has a positive attitude. John Marshall ended up winning last night’s game, 62-13. But that couldn’t wipe the smile off Campbell’s face. And not only did he get to play and score in his Senior Night game, he was crowned Homecoming king this year.